The counter service café cranks out hot, crispy, cinnamony tube treats. The churros are fine as is, but you can crank it up a notch with fillings—vanilla, strawberry, chocolate, cream cheese or the flavor of the day, which can range from guave to the eggnog-like Rompope. Pair the sweet with coffee, or go all in with milkshake. El stop: Pink to Damen. Bus: 21, 60. Love, love, love the Churro Factory. This is the best spot in Pilsen to indulge in sweets. Whether it's a midday treat or an after dinner snack. 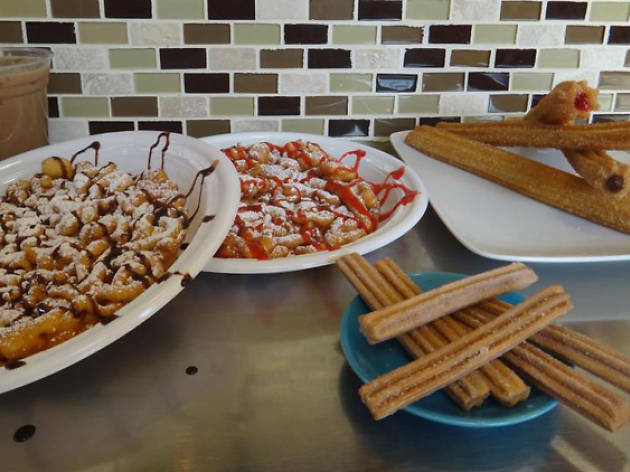 The churros, (which are delicious,) are not the only great offerings on the menu. 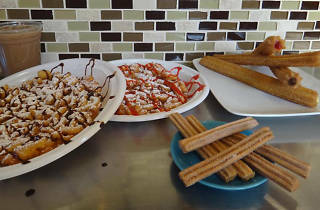 They also have ice cream, Mexican hot chocolate, & most importantly, funnel cake sundaes.